Where Will Shale Oil Go This Year? A horizontal drilling rig for natural gas in the Marcellus formation in eastern Lycoming County, Pennsylvania. How did the oil industry get to tap Pennsylvania’s Marcellus shale without a severance tax? Will that change in 2015? An investigation by the Allegheny Front and 90.5 WESA found the oil and gas industry spent heavily on lobbying while the state was writing regulations for shale gas. The industry spent $34 million on lobbying in Pennsylvania since 2007, according to the Pennsylvania Department of State’s lobbying disclosure database. That includes a high of $9 million in 2012, the year Act 13 passed. The money was spent by 27 companies that have drilled unconventional wells or are ‘board members’ of the Marcellus Shale Coalition, and five trade associations. Compare that to the state’s largest environmental groups — who spent about $1.5 million dollars combined in that period — and $330,000 in 2012. Flogging the oil industry for doing what comes naturally is important but solves only part of the problem. Supervision by the Public Utility Commission (PUC) has been removed from Act 13 by the Robinson Township case in the Pennsylvania Supreme Court, which restored local zoning control of oil and gas development. This ruling presumably deprived the oil industry of a significant part of their hard-bought legislative package. The election of Tom Wolf as Governor reopens the oil and gas severance tax topic, and as a result, the question of local zoning versus control by the PUC, or a different body, will be back on the table too. And one reason the oil industry does so well in the legislative process is that the environmentalists are a true Tower of Babel. Their seriously-held positions range from reasonable up to and including extreme back-to-nature advocates. In searching for useful middle ground, we need to peel away those who hope to cancel Pennsylvania’s and the nation’s amazing good fortune to have uncovered useful shale oil. This resource has changed our position in the world – going from heavily dependent on imported oil, to potentially becoming a major exporter of petroleum and gas. And the shale has changed the economy of much of the rust belt in Pennsylvania and Ohio. Some public, who do not live in shale country, are willing to mail in a check to fight the shale. But realistically, revoking development of the Marcellus is not on the table and will not happen. So the need going into 2015 is to find a sensible program of oil and gas taxation and regulation that keeps the baby healthy, and the bathwater that comes from shale development healthy too. The Open Lens Gallery of the Gershman Y, Broad and Pine Streets in Philadelphia, has on display a series of photographs from the Marcellus Shale Documentary Project, from now until February 14, 2013, on the drilling for natural gas in Pennsylvania. Photographs by photographers Noah Addis, Nina Berman, Brian Cohen, Scott Goldsmith, Lynn Johnson, and Martha Rial, displayed in the lobby of the Gershman Y, show the effects of Hydraulic fracturing, or “Fracking,” on communities and residents where it takes place. Photographs include one of the former Sunoco refinery at Marcus Hook, where the natural gas would be refined and transported; pictures of a three year old girl, Sylar, whose parents claim their tap water has been contaminated by gas drilling; contaminated water from a kitchen faucet; a woman who lives without water for bathing or drinking because the water in the community has been contaminated; a lobbyist for the natural gas industry standing, talking on a cell phone next to an anti-fraking activist holding a sign; a farm couple giving their horses bottled water to drink; and the Susquehanna River as it goes through communities affected by drilling. “Fracking” is the practice where a well is drilled into the earth, and millions of gallons of water, sand, and chemicals — identified as carcinogens, pesticides, biocides, neurotoxins, and endocrine disrupters — are pumped into the ground to force the natural gas out. Opponents of fracking have complained of emissions of natural gas into the air and contamination of water, and of people in these regions affected by such health problems as asthma, stroke, and cardiovascular disease. What is just happening in Japan and what is on the verge of happening in Pennsylvania have a deep connection. In the one, it might seem that disaster flowed from a small-scale decision: that it was “impossible” for a tsunami to get higher than x feet. That decision led to placement of emergency generators for the nuclear power plants in ways that made them vulnerable to being knocked out when a monster tsunami did in fact sweep across northern Japan. Result: already as I write (5:30 a.m., Eastern US time, Tuesday March 15) radiation at medium levels is venting onto nearby regions of Japan, carrying the seeds of cancer and death that have forced the Prime Minister to tell residents to stay indoors. In the next week, God forbid, there may be a full melt-down of one or more of the damaged plants, rendering large areas of Japan (and possibly Korea, depending on wind currents) as uninhabitable as the Chernobyl melt-down rendered parts of Ukraine, while increasing the rate of cancer deaths in a larger swathe of Europe. A small mistake, yes? — misgauging the power of a possible earthquake and tsunami. As minor as the small mistake that turned the BP oil well in the Gulf of Mexico into an ecological and economic disaster. But neither one was exactly a “mistake.” The whole nuclear energy system, and the whole system of deep-sea oil drilling (now again permitted in the Gulf), and the whole system of “fracking” for natural gas that endangers the drinking water of millions of Americans — all are the result of a far more profound transgression. That transgression is the pursuit of power to control the earth and other human beings that has run amok. Has become not mere “control,” but subjugation. And has brought Plagues upon the Earth and all Humanity, as tyrannical Pharaoh brought plagues upon ancient Egypt. All life on Earth is the result of a Dance between control and community. Eco-systems are ways in which any given species restrains itself from overwhelming its surroundings, encouraging other species to co-exist with it in a biological community- not using as much power to control as it might, so that it can continue to live in the longer run. In human culture, knowing when to Do and when to Pause, when to restrain one’s self, when to encourage a community instead of gobbling up all wealth and power for one’s self, is crucial. All the great traditions tried to teach this wisdom. Indeed, it was made them great, able to live across millennia. When some human institution of Power-Over over-reached, ran amok – like Pharaoh, the Babylonian Empire, Rome – the corrective came in a great new surge of community – new kinds of community. But Modernity has become an adventure in Over-reaching, Over-powering, far beyond any previous imperial power. And the result has been General Electric’s convincing Japanese governments that its expertise could overpower earthquakes and tsunamis, that nuclear energy was more “profitable” than wind or solar energy could ever be, that the “cost” of a billion dollars each for these brittle power plants was better spending than conserving energy in the first place, learning to live within limits, encouraging decentralized arrays of sun and wind power that lived in the nooks and crannies of the Earth instead of trying to dominate it. And the spending was better – for General Electric. And for BP. And for Massey Coal. But not better for the Earth or human earthlings. And now let’s look at the other obscene word — “fracking” — in the same light. It’s slang for “hydrofracturing” — that is pouring tons of chemicalized and pressurized water into shale rock that has within it natural gas that can only be accessed by fracturing the rock. But this means that the water table is poisoned. 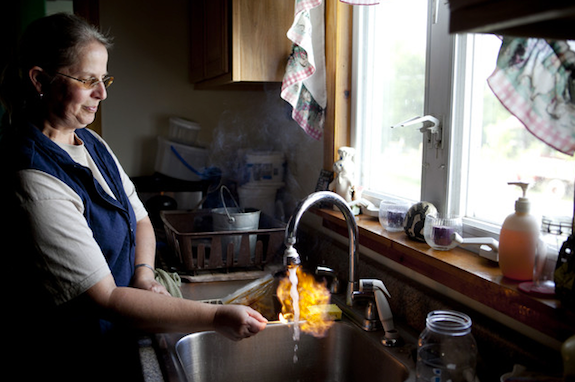 Watching the film Gasland, one sees drinking water flaming up – literally burning – when a match is touched to it. Obviously, thank God and the wisdom of our Congress, such processes that poison the drinking water of millions of people are forbidden by the Clean Water Act. But — Vice-President Chaney and the Big Oil conglomerates he worked for persuaded Congress to exempt oil and gas companies from the provisions of the Clean Water Act. How did they pull this off? With money, of course. Money in campaign contributions, money in lavish lobbying (of judges, not only Congress). This money was not wasted. It was an investment, mere millions paying off in multibillions of profit. And what did the exemption mean? That the fracking companies don’t even report what the chemicals are they are putting in the water. Independent researchers, working on shoe-strings, have isolated some of them: cancer-producers among them. And that the fracking companies expect enough profits to make it worth their while to buy state governors and legislatures. So in Pennsylvania, not only is there no regulation of fracking but not even taxes on the fracking profits. The companies plan tens of thousands of fracking wells in the Marcellus Shale region. In the shale region itself, some wells that have watered farm families for generations are already poisoned. It may take a generation for Philadelphians to start dying of the cancer-causing chemicals that seep into their drinking water. Just as it took the Fukushima nukes a generation to start poisoning the Japanese people. “Frack you!” say the oil companies. “Fukushima you!” says General Electric. What we need is the birthing of a new kind of community, just as ancient wandering Hebrews responded to Pharaoh with Sinai, as Biblical Israel responded to Rome with both Rabbinic Judaism and Christianity, as the Arabian tribes responded to the tyrants of Mecca with Islam. Rabbi Phyllis Berman and I concluded that that was the crucial wisdom we need to learn from the story of Exodus, when we wrote Freedom Journeys: The Tale of Exodus and Wilderness Across Millennia. For more information on the book, and on the Interfaith Freedom Seder for the Earth, please see the Shalom Center website. But it’s not just us, or that book. More, of course, to come. Blessings of shalom, salaam, of a deeper, fuller freedom for the Earth and all Humanity.